From the author of the blockbuster hit journals The 52 Lists Project and 52 Lists for Happiness, here is a home style book to help you express the creativity and style you already have! – A deeply personal essay from online curator and style maven Moorea Seal. – Exclusive looks into her beautiful personal space and tips for infusing your home with comfort and creativity. – Two inspired, on-trend, beginner-friendly DIY projects to personalize and decorate your home on a budget. – Droolworthy looks into the homes and inspiring lives of a diverse set of creative women, with their best tips and tricks for comfortable, creative decor. First off I have to say this is a beautiful book, inside and out. 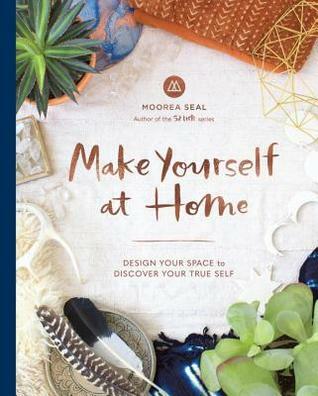 I very happy that a book about decorating your home and making it your own space visually is something you would display or have on your coffee table. You can tell serious thought has been put in. What I enjoyed about this book the most was the fact that it had sections dedicated to particular rooms in your house or apartment. Then it focuses on how you can take your own style and apply it. Not only does it give you inspiration, but it also give you a DIY for each of your rooms. I love this idea because you have a part it making the room. For me I love to see things I have made with my own two hands, it gives me a sense of pride to see something I made being displayed and not falling apart. I also liked that you hear from not just the author, but also many others. It is nice to get inspiration and tips from all over because not everyone has the same style. I approached that this book does not take the cutter cookie philosophy to design. Another great thing about this book is that at the end it does delve into design a bit. It talks about colors that can be used and which ones work well together. This is very helpful to those who are new to decorating and I think will help people take a few more color risks. One thing I did not like about this book is that it is perfect for a home or an apartment, but it is not ideal for people who still live at home with their parents or are away at Uni and are living in a dorm room. While some of the information can be useful, it is best suited for those who own or rent a place of their own. I also would have liked to see more style tips and examples of how to apply the ideas in this book. I am someone who loves visual and I would have loved to see more of the beautiful photographs that are already inside. I will admit I am a long time fan of Moorea Seal’s books and this one did not disappoint me. This is a lovely book; it is a great to pick up if you are in need for some home inspiration. If you are someone who is new to interior design or decorating, just moved, or looking to refresh your space I think this is very useful. Like I said previously, this book is not a cookie cutter home decoration book. It helps you decide what you like most and how to incorporate that into your space. It is all about making your space a place that makes you happy. That is something I really enjoyed about this book and I think others would enjoy as well. I highly suggest that you look into it.